The Sea Level Rise Risk and Vulnerability Tool displays the shift in the National Oceanic and Atmospheric Administration's (NOAA) mean sea level over time as a result of sea level rise and local land subsidence. 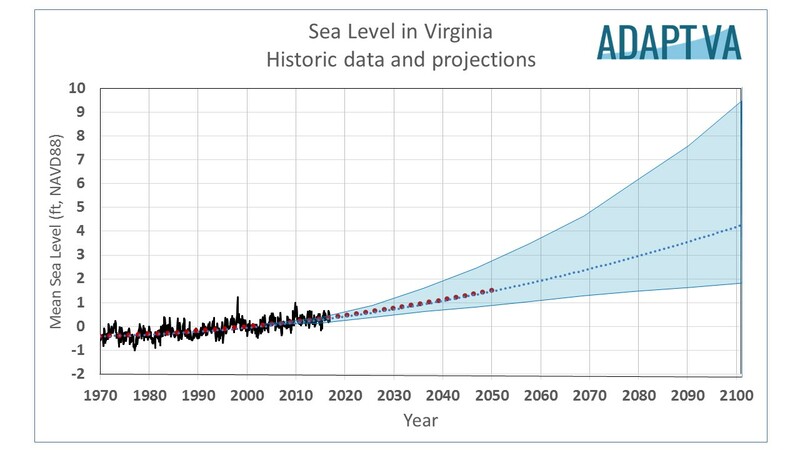 Future sea level rise scenarios are based on the 2017 NOAA Technical Report NOS CO-OPS 083 titled “Global and regional sea level rise scenarios for the United States” with consideration of local subsidence known to occur in south eastern Virginia. Surface elevations have been derived using high resolution LIDAR data where available. Microsoft Silverlight is an application framework for writing and running rich Internet applications, with features and purposes similar to those of Adobe Flash. To run the Sea Level Rise Risk and Vulnerability Tool, users must have Silverlight downloaded to their desktop computers. In most cases users are prompted for the download when they open the tool for the first time. If not, instructions for this download are available in the Sea Level Rise Tool User's Guide. This is not necessary for those running Microsoft Office version 2010 or higher which includes Silverlight. The user's guide also provides important details on the tool's development, use, and applications. Q: Why don't water levels change as the time slider bar progresses through time? A: The Sea Level Rise Tool uses port 6080 along with the traditional http port 80. If you have a firewall or proxy server that is blocking port 6080 it must be opened for the tool to work properly. Your IT department should be able to make that change. Parris, A., P. Bromirski, V. Burkett, D. Cayan, M. Culver, J. Hall, R. Horton, K. Knuuti, R. Moss, J. Obeysekera, A. Sallenger, and J. Weiss. 2012. Global Sea Level Rise Scenarios for the US National Climate Assessment. NOAA Tech Memo OAR CPO-1. 37 pp.